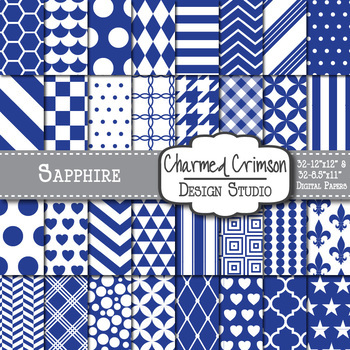 A beautiful pack of 32 different sapphire blue and white digital papers in two sizes. Patterns include stripes, polka dots, houndstooth, quatrefoil, checkerboard, lattice, gingham, herringbone, scallops, hexagons, plaid, chevron, stars, circles, hearts, beads, triangles, fleur de lis, diamonds, squares and bubbles. 1171 - Copyright 2015-2019 © Charmed Crimson ~ All Rights Reserved.